This beautiful home features top-of-the-line appointments throughout. Granite Countertops, Hardwood Floors, Beautiful high-end cabinets and Designer Furnished for your comfort. This home is located 2/10 of a mile from the foot bridge to the beach ( 7 min. walk) in the Inverness Section of Palmetto Dunes. Bright and open, this home is tremendous for a family gathering. The bright open living room features hardwood floors, two sofas, two chairs and a TV/VCR/DVD and audio system. Doors from the living room step out to the back deck furnished with a table and six chairs overlooking the pool and spa area. The kitchen area opens up to the living/dining area and is very spacious. An eat-in bar area with six bar stools surrounds the kitchen. The dining room has a table and ten chairs. Three bedrooms are on the first floor. The master bedroom has a king bed, TV/VCR, private bathroom with double sinks, jetted tub and separate shower with his and hers shower heads. Doors from the master bedroom lead to a private back deck with a table and chairs overlooking the pool and spa area. The second bedroom has two twins, TV/VCR and shares a bathroom with the third bedroom. The third bedroom has a queen bed and TV/VCR. On the second floor you will find the large fourth bedroom - this room has two queen beds, TV/VCR and a private bathroom. The backyard has a sunny kidney shape pool with spa. On the patio around the pool is a weber gas grill and several lounge chairs. *Pool may be heated upon request for an additional charge. Beautiful, spacious, spotless and with a great location! We loved staying at this beautiful, spotless home. The home has a great lay-out and was spacious for all of our family with 3 separate sleeping wings. The kitchen and bathrooms were beautiful and updated and the home is larger than it appears in the pictures with high ceilings and is very nicely furnished. We loved the pool and the short walking/biking distance to the beach. We had a great vacation at this beautiful home and hope to return again next year- thank you!! Wow! This home impressed everyone in my family upon arrival. This was absolutely perfect for 3 families (2 grandparents, two sisters and their families). The house has a large central common living area and three "wings" with private sleeping areas. The ceilings are very high and the house was immaculately clean and tastefully decorated. Everything you could possibly need is already provided and in perfect condition. The backyard patio was private, beautifully landscaped, and had a medium sized pool. It was a great place to relax after a morning at the beach. The location inside Palmetto Dunes is walkable to the beach, although we rode our bikes every day. I can't say enough good things about this house---I've rented in HHI before and it didn't come close to this. We also looked at real estate while we were in HHI and none of the homes came close to this one. Thank you, Wally and Chris, for letting us enjoy your home. It was the best part of a perfect vacation. Glad you enjoyed your stay. We are looking forward to going next week. Wonderful house and location in a great resort community. Renting bicycles from Hilton Head Outfitters is a great option for easy to get around, healthy transportation. Having access to the free "Dune Buggy" is also a great way to get around the area. The Shoczolek's have a true Gem in Hilton Head. The house was beautiful! It was a great place for our family and grandchildren. Mary R.Where do you live? The house had everything you needed from outdoor grill to mixers, dishes, and any appliance you could hope for. The pool was fabulous! We enjoyed our evenings there. We also appreciated the nice outdoor table and lounge chairs. We had eight adults and there was seating for all of us. The owner was great to work with during our stay. It was very clean. I would recommend it and rent again. Thanks for sharing your wonderful house which has a fabulous set up. The really is nicer than it shows is in the pictures. Easy walk to the beach. Great time. 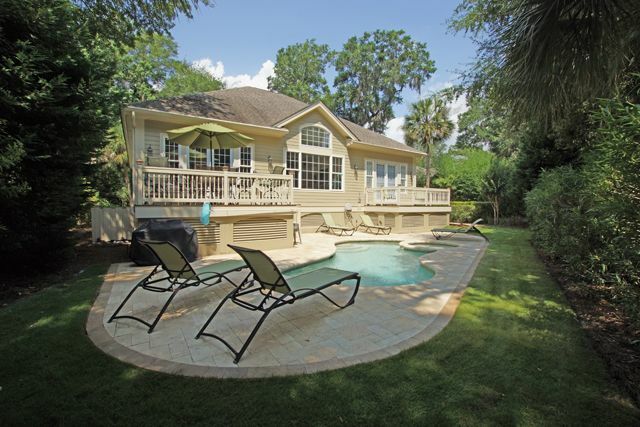 One of the best and beautiful rental homes in Palmetto Dunes! My family rented this beautiful home this past week and we totally enjoyed ourselves!! The home was perfect for our family which included 3 couples and 5 grandchildren! It is a short bike ride to the beach, close to the tennis center and the pictures of the home don't do it justice. Our family enjoyed this beautiful home, and the pool was a huge hit for our grandchildren!! The rooms have ample space, nice comfortable beds and nicely decorated! Wally and Chris provided extra things for our stay, even fans for the bedrooms if you wanted it!! We would definitely want to rent this home again and will heartily recommend this home! The rental agency also responded with all of our questions! Thank you Wally and Chris for allowing us to enjoy your beautiful home!! We hope we can come again soon! !